Cindy Freed from Genealogy Circle giving a lecture at the Ohio Geological Society in Bellville outlining the resources that are available to the public to begin individual research. Have you heard stories from relatives about family members involved in the Civil War? You may have a name or a regiment of someone that you meant to further explore but haven’t gotten around to it. With help of online government archives, tracing your Civil War ancestry has never been so easy. 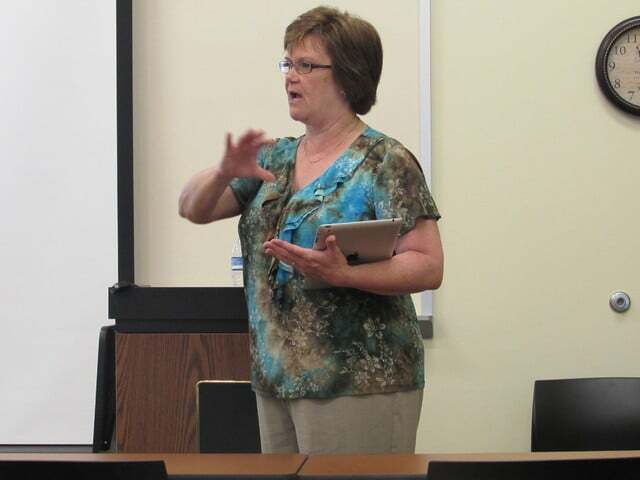 Cindy Freed from Genealogy Circle recently gave a lecture at the Ohio Geological Society in Bellville outlining the resources that are available to the public to begin individual research. To begin her search for her Union ancestors, Freed relied on the information provided through an extensive archived document system. The government has an enormous database that has compiled Civil War records through the organization titled the National Archives and Records Administration. Their files can be accessed at archives.gov. According to the website, compiled service records consist of an envelope containing card abstracts taken from roll calls, returns, pay vouchers, and other records. They provide the ancestor’s rank, unit, service dates, basic biographical information, medical and military information. That information is invaluable to those beginning their genealogical research, Freed said. The compiled military service record costs $30 and can either be mailed as hard copies or digitally formatted. With the approaching Independence Day holiday, many online resources offer a free weekend for users stated Freed, so it’s a great time to begin your research. Using the government’s compiled service records Freed was able to uncover some of her ancestors’ battlefield experiences including an incident in which a relative was shot. The medical information the archives provided the story his battle injury experience. While a seemingly daunting task, researching Civil War ancestors can be a manageable process. Often times new researchers do not know where to begin and lengthy lists of Civil War veterans are not exactly inviting to those who are unfamiliar with them. To get past the initial challenge Freed offers some advice. Freed is a seasoned Civil War researcher, she has written a book since beginning her work titled, “Ancestors in a Nation Divided,” as well as a started website devoted to her passion. She also lectures to groups about beginning research. Her dates are listed on her website genealogycircle.com. This entry was tagged Bellville, Civil War, July 4, Ohio. Bookmark the permalink.